It’s no surprise that kitchen remodelling is at the top of this list. The cost of remodeling your kitchen usually depends on the finishes you want and the size of your kitchen. In some cases, you might need to replace parts of the kitchen as a necessity. This includes worn-out appliances and outdated kitchen equipment. Expect to spend between £10,000-£30,000 on the average. The return on investment is worth the investment at 85%. The beauty of a loft conversion is that you don’t have to pay for foundation work. This allows homeowners the opportunity to spend their budget on the interior and finishes. A loft conversion is the easiest way to add a new bedroom or bathroom to your home. Average cost ranges between £15,000-£40,000 with a potential value of 12%. Fixing issues with your roof or replacing parts of the roof might save money in the short-term. Eventually, you’ll have to replace the entire roof. The most important thing is finding a reputable roofer who will get the job done on time and within budget. Average cost is between £2,500-£4,500 with a potential return of 63%. You might have to give up garden space to get this done but its’ worth it. If you’re covering only half of the land of the original house, you won’t need planning permission. You’re also exempt from rules on fire safety and structure if three-quarters of the roof and half of the new wall is made with a translucent material, or glazed and external doors separate the conservatory. The cost ranges between £5,000-£30,000 with 15% value added. Similar to a loft conversion, a basement conversion eliminates the need for structural cost because it’s already part of your home. According to experts, most people who apply for a loan usually turn the space into an additional bedroom, bathroom or entertainment room. It requires proper insulation to provide warmth in winter and coolness in the summer. In Britain, 90% of the garages don’t have a car. If you fall under this statistics, it’s time to consider a garage conversion. The potential cost ranges from £10,000-£15,000 with a 15% value added. To calculate the exact potential value, multiply the extra square footage by the local square foot price. The cost of a bathroom remodel is dependant on what you want to do and the size of the room. A full remodel cost more. You should budget for the cost of labour, bathroom fixtures, cabinetry and hardware, plumbing, flooring, windows, doors, walls and ceiling among others. Potential cost ranges between £5,000-£10,000 with a 3% value added. 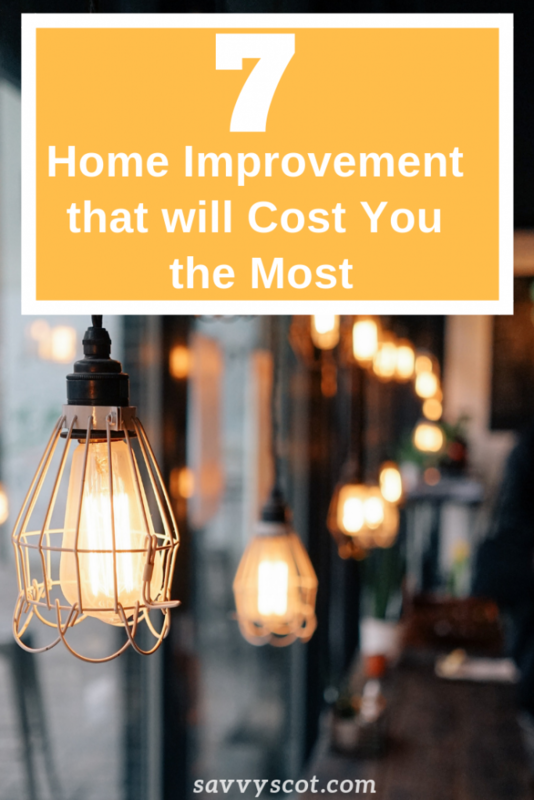 While many home improvements cost a lot of money, some of them are effective. Prioritise on those guaranteed to add value to your home if you want the most return on your investment. And remember that when it comes to choosing a contractor to implement these changes, they must be an accredited tradesman with the correct coverage that will protect both of you in the event that the project might run into problems.